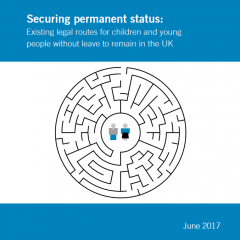 This guide was first published in 2013 to outline to individuals, organisations and policy-makers the legal routes through which children and young people can attain status in the UK where they are currently undocumented. The updated paper considers the possible routes to regularisation for those without status, including citizenship, EEA rights and applications inside and outside the Immigration Rules. This document is not intended for use to assist individuals with their immigration applications, but instead is designed to highlight the legal options to gaining status, and some of the particular hurdles, including financial and evidential requirements, that are faced when regularising immigration status. It cannot replace legal advice for someone who wants to make an application. The complexity of the UK’s immigration system is well-known, and although this paper does not aim to set out every route by which a child and their family can make an application under the Immigration Rules, it is intended to clarify the options that may be available to children, young people and families.